This drafting chair combines contemporary design with a mesh back and upholstery to promote comfort and breathability. The chair allows for maximum adjustments of the back angle, seat height and tilt, and the foot ring to give every user a comfortable experience. It also includes a heavy-duty, nylon five star base, hooded casters for carpeting, and 360-degree rotation. Additional upgrades include height adjustable arms for an additional charge. With all of these features and a lifetime Office Star warranty, this is one drafting chair that everyone will love. 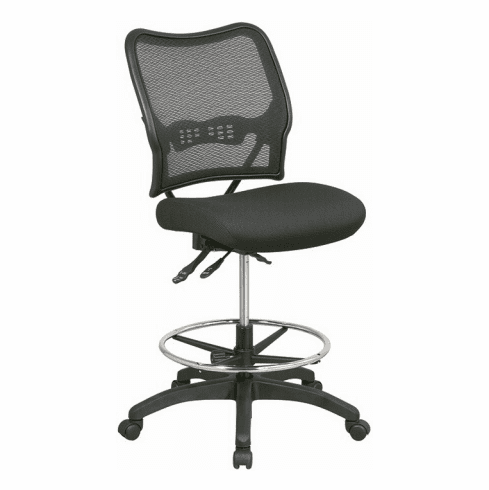 Chair design meets or exceeds ANSI/BIFMA standards for comfort, durability, and safety.